No se sabe, quizás Shun de Hades. 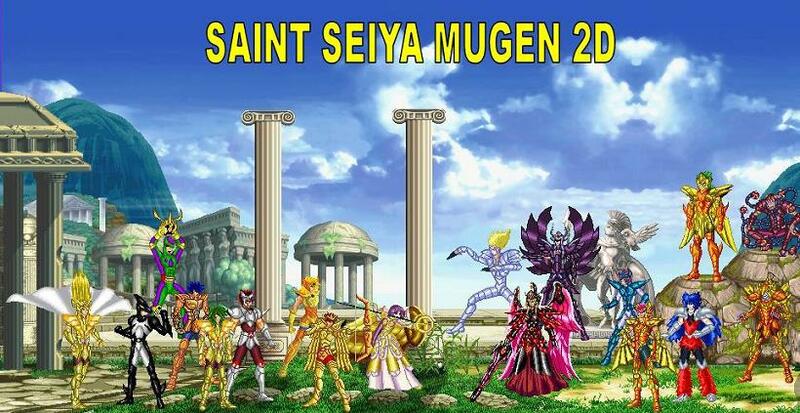 Ajajaja Tio, me extraña, tu hace rato estas en el mundillo del mugen saint seiya, como es que no reconoces al Imposible Shura de GC (Pues no lo nombro por que ya no se merece ni que lo mencionen al pasar a este sujeto). Vamos amigo sin duda lo has visto antes pues solo que no lo debes recordar. la verdad,ni idea.yo solo me baso en jugar y coger chars.imagino será un menda este tio.pero me da igual ya que lo único que quiero es el chars si esta disponible.hace tiempo decidi tomarme a broma la gente que intenta monopolizar el mugen o se autoproclama omnipotente figura de la perfeccion,jejeje.si no lo recuerdo mejor,solo busco el chars,esta disponible? 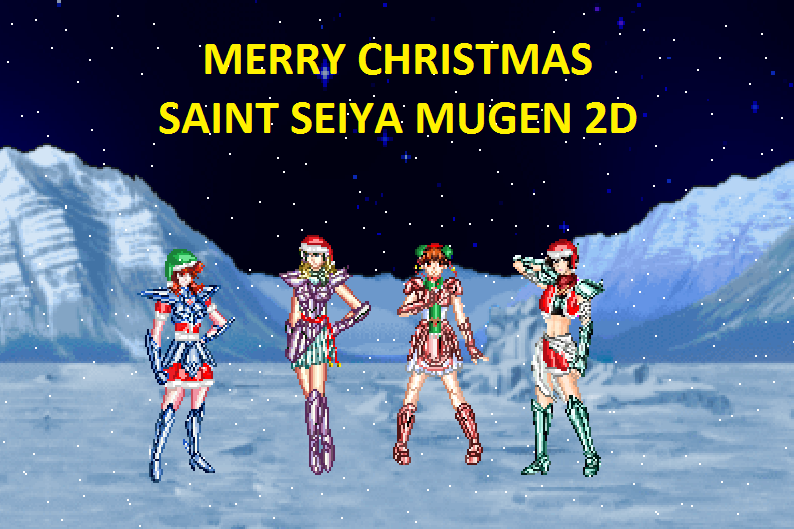 The only information available on this project is a news that Tux spoke in mugen Pixart this year. According to him, the author of this Shura said that he still has the file and that he intends to release it one day. He did not specify a date. To say more than that is to speculate. We can only await its launch. It all depends on the author. 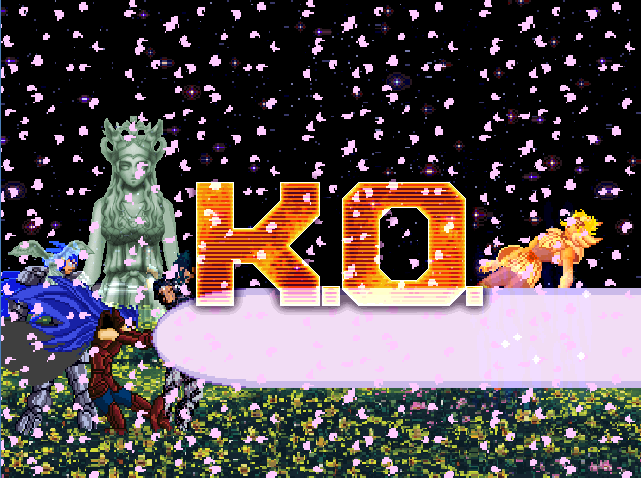 Face each work mugen's as a work of art. It will only be ready when the artist makes its final act. We spectators can only hope. These times a mugenarquive user has released a new edition of pandora. The graph work improved noticeably. The file is small and I believe everyone will be able to download without registration. Well for the moment, that's all. When I can, I'll release some news. 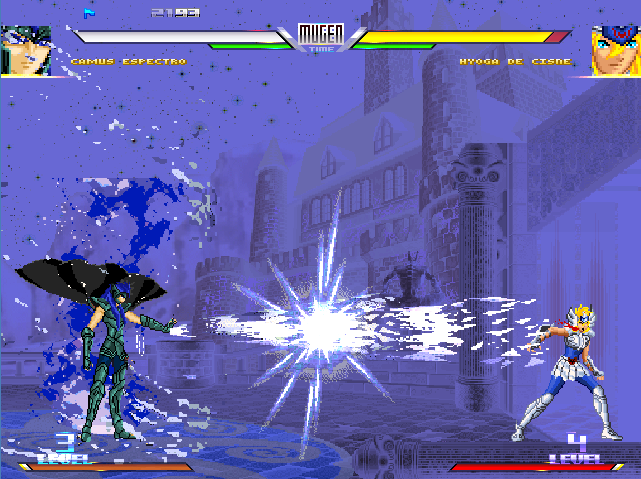 oscartsg1 wrote: hace tiempo decidi tomarme a broma la gente que intenta monopolizar el mugen o se autoproclama omnipotente figura de la perfeccion,jejeje.si no lo recuerdo mejor,solo busco el chars,esta disponible? Pues, no Oscar como te dijo Orion y hasta donde se, el sujeto este nunca lo libero y creo que nunca lo hará, quizás cuando tenga 80 años . Quizas lo tenga el italiano y el grupo cerrado de Pixart. Pues creo que no solo por mi si no por mucha gente opino que se lo pueden quedar ya a comparación de los shuras actuales el de ese video es horrible. 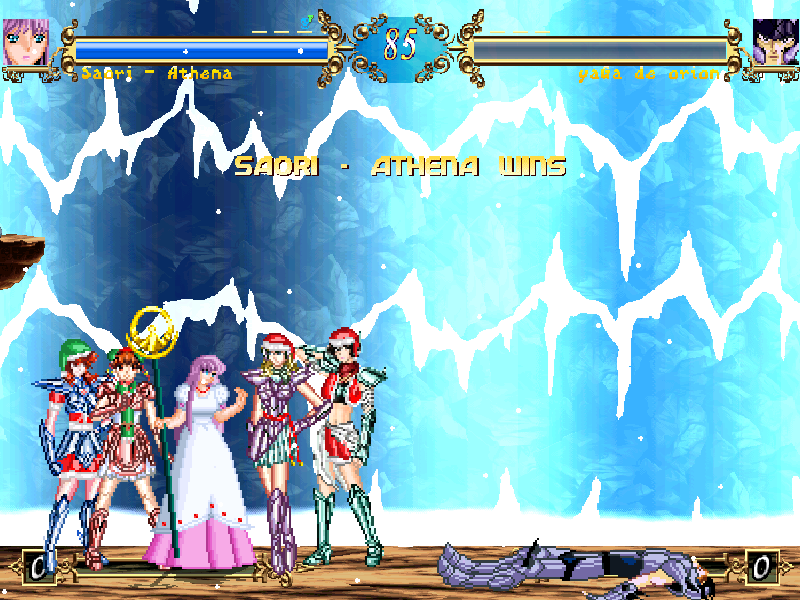 thanks.i play this chars but need more sprites and the i.a no is very good. I'm work to play with this char for the tag system. I will finish the pixel review on the dress. I changed the colors of hair and skin. So we will can have other palettes. When I can, I see the AI question. I would also like a sprite-maker to finish the speciais with the judges. At the moment I brought the radamanthys back and left the hyper with aiacos. However, this last blow still needs adjustments. For the time being, the work are stopped. I'm working in another char, completely new. Now, I just did some tests and some things done. I'll finish the project tag system and help finish the chars I can. After reviewing the new Pandora, I look back at krishna. Well, one hour this would happen. The authors are not eternal, some have already retired. Another, still is in the mugen, but lack time and with the pc broken is difficult to buy another quickly in a short budget. As in the case of Tecla2000 and Markgz. Well, I'll finish what I promised, I assure you. However, I have to agree that at least some chars could be released. There is a universe of at least 10 chars that could come out of the drawer. But, it depends on the authors, especially if they still want to add something to the project. We can only wait. For my part, I realized how finite I am. I do not open new projects and currently I try to publish everything I can, always with the support of other authors with whom I work. Let's hope for better days in mugen. Vou terminar o projeto tag system e ajudar a finalizar os chars que posso. Depois de revisar a nova Pandora, volto a olhar para o krishna. Bem, uma hora isso iria acontecer. Os autores não são eternos, uma parte já se aposentou mesmo. Outra, ainda segue no mugen, mas falta tempo e o pc quebrando é dificil comprar outro rapidamente num orçamento curto. Como no caso de Tecla2000 e Markgz. Bem, vou terminar o que prometi, isso garanto. Porém, tenho que concordar que pelo menos alguns chars poderiam ser lançados. Existem um universo de ao menos 10 chars que poderiam sair da gaveta. Mas, isso depende dos autores, principalmente se eles ainda desejam agregar algo ao projeto. Só podemos aguardar mesmo. De minha parte percebi como sou finito. Não abro mais novos projetos e atualmente tento publicar tudo que posso, sempre com o respaldo de outros autores com quem trabalho. Vamos torcer por dias melhores no mugen. The char of the shoko does not exist, but in one of edittions of the master-shion friend's, she appears as an assistant in the char da marin. I do not know if the author thinks to make a solo char. For the time being, his concern is to finish the open projects, because time goes runnig by and in mugen new things are done by hand and this takes a monstrous time. When he runs out of projetcs, we'll probably see what our friend is going to do. Reviewing the camus Spectrum for the TAG system. 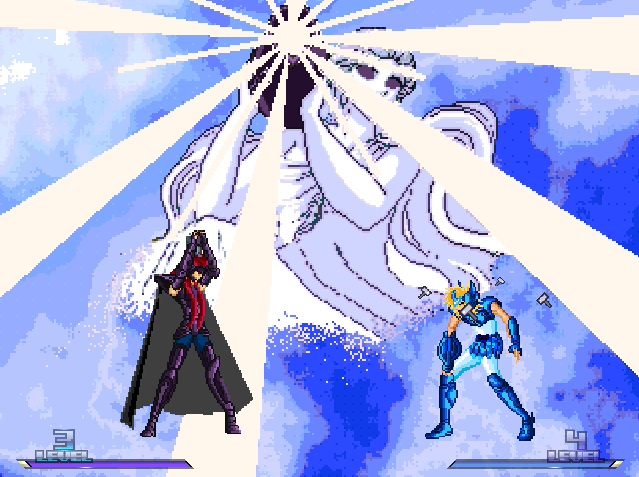 He also underwent a revision of pixels, the athena exclamation was reformulated, besides intending to carry some things of the version of the aioros. In the Tag format I intend to eraser the hyper athena exclamation of the gold version, because it does not make much sense to keep it. I intend to leave the blow as something specific to the spectrum version. In October I release more chars for the TAG system. They're Wips. At the moment the sprite-maker and programmer is away because of problem in your PC. Their author is Markgz.